Christmas is in 2 days and I've giving up on having that Christmassy feeling. I guess there's really such a thing as outgrowing it. I think those primary school days were the really fun ones when we always get nice packages from Father Christmas and always get really anxious to see what we were given. On a general basis and in the spirit of Christmas, I decided to share my top 5 favorite things about Christmas in no particular order. 1. Hampers : I've got a special love for this and I can't even explain it. I can still remember the very first hamper we got years ago and how excited I had been at finding variety of items in the basket. A new hamper came in today and you should have seen me giddy with excitement. This snap was from last year and the love is still as strong. 2. Giveaways - So, way before I had a blog that made me join Instagram, I used to say I'd join only because of giveaways and I meant it. There was this giveaway I was totally interested in but it had something to do with IG which was so painful. Sigh. That aside, the number of giveaways I've been seeing has been incredible! I've been lazy about some of them tho but I got lucky with one from Ebony Life TV just yesterday and it felt so cool! I entered for one other blog giveaway. Fingers crossed on that. Goodluck to all of us participating in giveaways. 3. Carols - Because Christmas songs are super melodious and kind of bring back childhood memories. What's your favourite Christmas song? The one that's been ringing in my head for days is 'Hark the herald angels sing, Glory to the new born king... 🎶🎶'. Confession : I don't even know up to 2 verses. 4. Wishlists - I honestly don't have one penned down but it's all up in my head. This is making the list simply because I love reading that of others. Even though doing that provides more items to lust over, I still find fun in it. Patiently waiting for when I'd be able to help someone tick off items off theirs. I don't mind Cassie's blog planner tho. Hehe. 5. That touch of red - So I came across a Instagram page that asked what the colour of Christmas should be, whether green or red and in the comment section was this really smart answer that said if it's all red, it'd be valentine and if all green, it's spring. I found so much sense in it as she went on to say it's green and red that makes up Christmas. Apart from the fact that I don't really dig the colour green, red is what virtually everyone goes for when choosing a Christmas outfit and it sure looks good. Am I the only one that doesn't have their Christmas outfit picked out yet? More importantly, I love the reality of Christmas. The fact that it isn't just about the 5 things above but about the fact that we're celebrating God's love for us. The birth of Jesus Christ whose name and mission is all about saving and redeeming us. It's very easy to be lost in the whole 'Christmassy' feeling without remembering the basic significance. Way too easy but we have to be intentional about it and be continually grateful! Apart from rice, what are you going to be eating/preparing? Do we have mutual favourite things? I'd love to hear from you please? Kindly leave me your thoughts. It doesn't feel like Christmas over here. My fave part of Christmas is watching home alone and other holiday movies, it gets me in the spirit of Christmas. Somehow this year is totally different, i'm just going to sit at home and wait for my friends to call me to come over to eat Christmas rice. Merry Christmas. Love love Carols. And I came across the answer on that Instagram question on Christmas colours. I hope you had a great day! 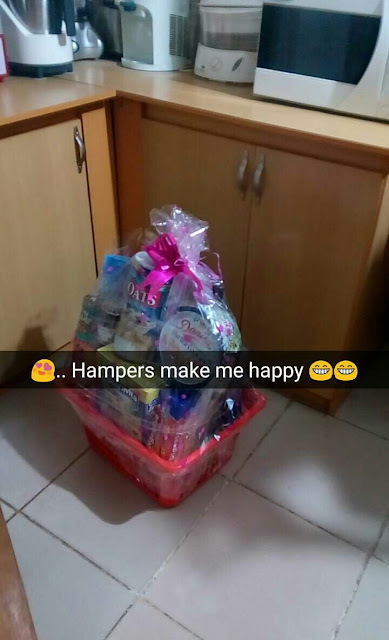 Hampers bring childhood memories. I had a wish list for secret santa at work, I got chocolates instead. I love Christmas carols so much!I love when everyone gets to sing them in church during Christmas services. Creates such a beautiful atmosphere. Merry Christmas dear. OLAA, these days Hampers are also feeling the recession... And even the main things are not included anymore. I really can't explain it but I just hate the Nigerian mentality to trade and festive periods. I love everything about Christmas, everything, Jesus, gifts, family, red you name it. Hope you had a great one but I have a feeling that you did! I love everything about Christmas, including Harmattan. Only that the Harmattan came quite late this year. But I'm loving it. Compliment of the season, sweets! We don't have mutual favourite things, I can't believe you didn't include unlimited food. Being able to eat uncountable pieces of meat and drink bottle of juice and mineral without complaints from parents is NY favourite part of the holidays. And when I was living abroad, I loved the Christmas sales too. Hope you ate a lot. This Christmas was definitely far from one of the best (had injections all week, and on Christmas Eve and Christmas day), and I couldn't even eat any of the good stuff because the terrible ulcer but I think I still really liked how peaceful it was for me. And then my birthday was much better than I expected it to be. My favorite thing about Christmas has to be all the lights though , too beautiful.